Investors gather at bankruptcy court to find out if they'll ever get back Madoff money. Which government rescue program will help the most people? NEW YORK (CNNMoney.com) -- Investors allegedly swindled in the largest Ponzi scheme in history reacted furiously when they learned Friday that Bernard Madoff didn't put any of their money into securities for at least 13 years. Several hundred of the 2,350 Madoff creditors gathered at the U.S. Bankruptcy Court in Manhattan to learn about the status of their claims and to revile the man accused of stealing their life savings. Irving Picard, the court-appointed trustee for the liquidation of Madoff's assets, told the crowd of angry investors that investigators, in their search of at least 7,000 boxes of financial documents, "found no evidence to suggest that securities were purchased for customer accounts." 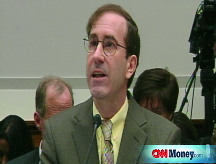 They also had some choice words for the Securities and Exchange Commission that failed to protect them. "We're not just the victims of Madoff; we're the victims of the incompetence and irresponsibility of the SEC!" said Raymond Spungin, a 77-year old investor from Staten Island. His statement was answered with loud applause from the crowd. Spungin said that he and his wife, Felice, had invested $700,000 in Bernard L. Madoff Investment Securities LLC, which informed them that their assets appreciated to about $1.8 million. "I don't expect to be getting any back," said Spungin, who is living off his pension and social security. But investors were told they would get back some of their funds, depending on how much they'd invested, and how much the government recovers. Picard said that some $650 million had been recovered so far, which was to be divided among investors, commensurate to how much they'd put in. "Everyone shares the pain," said David Sheehan, a lawyer on Picard's staff, adding that the total recovery of funds was "very unlikely." Also, the investors could be eligible for $500,000 from the Securities Investor Protection Corp., a government entity that provides funds to victims of failed brokerage firms, said Picard. Creditors will receive notices about the status of their claims within a couple of weeks, said Picard. Picard said the investigators were continuing to evaluate artwork, like "prints" and "little statues," and other assets from Madoff's firm to add to the recovery fund. He said the relatively unsullied market-making portion of his business would be sold to raise money, as well. Estimates of Madoff's alleged theft range as high as $50 billion. David Sheehan, a lawyer on Picard's staff, said investigators were still trying to find out where the bulk of the money went. "We will be looking at a broad spectrum of what happened to the money that went in and went out," said Sheehan. Madoff, who is currently residing with his wife in their $7 million Manhattan apartment, used $10 million worth of assets to secure bail. The bail was placed against his home, as well as his wife's residences in Montauk, N.Y., and Palm Beach, Fla. Sheehan said the law does not allow these assets to be seized for the recovery fund, because then Madoff would have to go to jail. "Not that anyone in this room gives a damn about that," he added, to the laughter of his audience. Ron, a textile distributor who would not provide his last name, said he lost 30 years worth of pension savings to Madoff's firm. He said he was more concerned with getting his money back than in punishing the most hated man in New York. "It doesn't help me whether he's in jail or in his apartment," he said. Madoff, 70, was arrested in December and charged with one count of securities fraud. Instead of investing his clients' money, he is accused of using the newest investments to pay off older clients, to create the appearance of returns, in a classic Ponzi scheme. His victims include celebrities like Kevin Bacon and John Malkovich, and charitable organizations, like the foundation established by Holocaust survivor and Nobel honoree Elie Wiesel. If convicted, he could face a 20-year sentence and a $5 million fine. He has not been indicted. Madoff's next court appearance is scheduled for mid-March.